Luxembourg’s capital is an ideal and affordable place to visit with your friends and family. Find out which activities are free of charge and enjoy your short break in this unique capital city. Luxembourg city is a place of diversity and contrasts and often referred to as the green heart of Europe. Green areas invite the visitor to take a walk or go on a cycling tour. Due to its human scale, the city can easily be visited on a short break or during a weekend trip. Luxembourg’s capital is also an ideal and affordable place to visit as several activities are free. If you are visiting the city for the first time, grab a leaflet and start a City promenade on your own. You will discover the most important historic sites and find out why the city was called “Gibraltar of the North”. The impressive fortification which was added to the UNESCO World heritage list, is the result of the best military engineers from Burgundy, Spain, France, Austria and the German Confederation. Enjoy its panoramic view from the Corniche, the “most beautiful balcony of Europe”. During the tour you will pass by the impressive Grand-Ducal palace, the restored Cercle Cité, the famous Gëlle Fra memorial on the Constitution square, the Cathedral of the Blessed Virgin and not to forget the Bock promontory. From the Corniche you have an amazing view of the Neumünster abbey and the St John’s church, with its Renaissance portal, an organ from 1710 and the remarkable Black Madonna. Both worth to be seen! 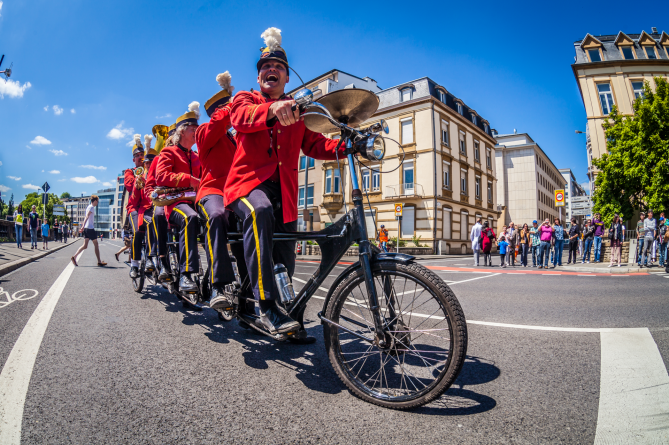 For an extra amount of fun, don’t miss the Summer in the City Festival which takes place from end of June until beginning of September. During this period you can enjoy free concerts, markets, exhibitions and sports events throughout the city. If you are interested in religious heritage, don’t miss the Quirinus chapel, a gothic pilgrimage chapel erected in 1355 and partly hewn in the rock. St Michael's Church is the oldest church in Luxembourg city and was destroyed and reconstructed several times over the past centuries. If you cross the Adolphe bridge, you will see the beautiful headquarters of the State and Savings Bank. This building, or more specifically the former spacious teller room, houses the Bank Museum which is open Monday through Friday. The Art Gallery "Am Tunnel" located in the underground galleries of the “Rousegärtchen” building, houses amongs others a permanent collection of photographs from Edward Steichen. It is also open from Monday through Friday and Sunday afternoons. The Post and Telecommunication Museum, located in front of the train station, reflects the history of the post and telecommunications in Luxembourg and is open on weekdays. Museums that are part of the Museumsmile offer free admission on certain days. Check it out! The Kirchberg district is another must see while you are in Luxembourg city. The European quarter is known for its futuristic and modern architecture. The best example is the outstanding building Philharmonie, a concert hall created by Christian de Portzamparc. Right next to it you can spot the Mudam (Museum of Modern Art) tucked into the fortified walls. The new part is a mixture of sober, modern and monumental architecture and was created by Ieoh Ming Pei. The museum is connected to the Museum “Dräi Eechelen” with a rooftop from where you have an unexpected view of the surroundings. The green space facing the city center is perfect for a little rest or a picnic with your friends. The tour ‘Architecture and art in public space – Kirchberg’ enables you to discover all the sculptures, modern buildings and artworks in this unique neighborhood. If you want to dive into the history of Luxembourg during the war, follow the World War II circular walk. You will learn how some of todays buildings like the Town hall were used and you will find out what the different memorials throughout the city stand for. The tour takes approximately 1 hour. 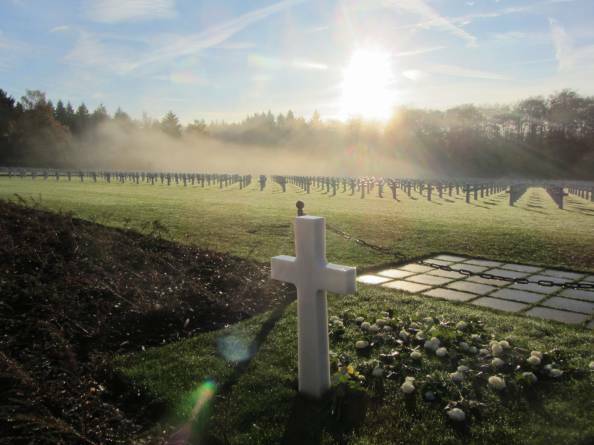 Another highlight will be the American and German cemeteries on the outskirts of the city. The American Military cemetery is the resting place of 5 070 American soldiers who fell during the Second World War. At his own request, General George S. Patton was buried here as well. The German cemetery in Sandweiler is the resting place of approximately 10 885 German soldiers who died during the battles in 1944-1945.